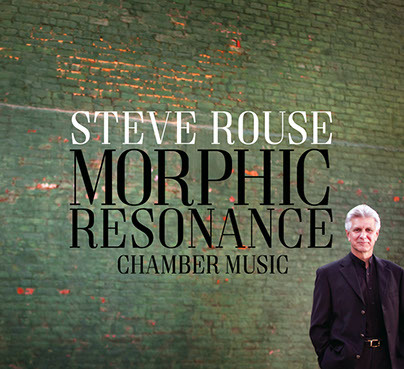 The music of Steve Rouse has a kind of natural fluency born of a convincing inventiveness. We can hear this to excellent advantage on his recent album Morphic Resonance, Chamber Music (Ravello 7973). Steve Rouse has a voice, a presence, an original take on the Modern Contemporary project. Five compositions grace this volume. Each one reveals special aspects of the Rouse approach. Each is sure of its goals and realizes them with distinction. "Sonata for Violin and Piano" has a Neo-Classical Stravinsky-esque flavor. There is a joyous rhythmic drive and an infectious melodic-harmonic fingerprint of Rouse-ness nicely to be heard throughout. "Form Fades" for six chamber instrumentalists has motor propulsion and repetition outside of a typically orthodox minimalist range--the repetitive elements occur more in developmental blocks than post-African line movement. It is not-so-much "through" rhythmically as it is a matter of cubistically conjoined sectional blocks that whirl for a certain time, then give way to a new sonic event. I would say that this favorably reminds me of Luc Ferrari's "Interrupteur" and "Tautologos 3." Yet I say that not because it sounds like either. Rather there are surface plane divisions like a cracked earth mantle. The divisions have related yet distinctive differences to them, so that a traversal is not a repetition overall so much as movement along various fault lines. That is, if that makes any sense. Like the Ferrari works I have loved for so long, you do not feel a suspension of time. You feel strongly a movement forward. It is beautiful, original music! "Nevolution" brings together a primal ahead-directed piano part with expressive scaling-searching trumpet (actually corno da caccia) often with a natural resonance. It is a memorable and idiosyncratic work. "Ten Little Things" pits clarinet with percussion for some very rousing and expressive miniatures. The variable coloration of a battery of percussion instruments feeds the clarinet part with contrasts. A series of open explorations results, ear opening and ever-shifting in its trajectories. "King Tango" is the short yet eventful closer. Flute and double bass send us off in style in a nicely jagged, futuristic manner. There is much to savor in this compressed moment of farewell. So we have an end to a worthy and original program. Steve Rouse has it, a voice for our times. Any fan of New Music will no doubt find this as essential as I did. Get it!